Nikon UK is pleased to announce the introduction of the NIKKOR 28-300mm with a totally new zoom range to the NIKKOR line-up. Featuring almost 11x zoom ratio from 28mm to 300mm this versatile optic brings new levels of flexibility to FX format DSLR users. Nikon UK is pleased to announce the introduction of the AF-S NIKKOR 28-300mm f/3.5-5.6G ED VR with a totally new zoom range to the NIKKOR line-up. Featuring almost 11x zoom ratio from 28mm to 300mm this versatile optic brings new levels of flexibility to FX format DSLR users. Zurab Kiknadze, Product Manager Lenses, Accessories and Software, Nikon Europe says: ?We are really excited about this new, all-round lens in the NIKKOR range. The DX format 18-200mm proved to be a massive success, and we are happy to introduce FX format customers to the same advantages this lens can offer. 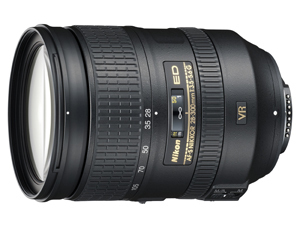 The AF-S NIKKOR 28-300mm f/3.5-5.6G ED VR?s huge 10.7 zoom ratio makes it the ultimate ?walkabout? lens. With an impressive 28-300mm focal range it is set to become a very popular all-rounder for those seeking ultimate coverage from a single lens, useful when travelling light, or working from a fixed position. The flexible aperture range keeps the lens size and weight to a minimum while still providing attractive depth of field effects at the telephoto end. Nikon?s exclusive second generation Vibration Reduction system (VRII) enables steady hand-held shooting at all focal lengths with two modes: Normal and Active. The optical VR system also stabilises the viewfinder image, enabling more accurate autofocus acquisition and framing, especially at the longer focal lengths of the 300mm zoom range, where lighter weight lenses can increase the risk of unwanted camera shake. The Silent Wave Motor (SWM) was designed specifically to deliver quiet and accurate AF operation across the extended zoom range with intuitive manual override. A zoom lock switch prevents ?zoom creep? (the lens moving under its own weight when tilted during transportation) and maintains compact dimensions when not in use. The lens construction features extensive use of magnesium for durability and provides well-balanced handling. Picture angle 75˚-8˚10? (53˚ – 5˚20? in Nikon DX format).